Lionel Messi paid tribute to team-mates past and present after reaching 400 LaLiga goals for Barcelona in Sunday's 3-0 win over Eibar. The 31-year-old is the league's all-time top goalscorer by some distance, having surpassed the previous record of 251 – held for 59 years by Athletic Bilbao great Telmo Zarra – in November 2014. His latest landmark goal doubled Barca's lead over Eibar at Camp Nou, producing a typically clinical finish with his left foot in the 53rd minute. The Argentina international is now 89 goals ahead of Cristiano Ronaldo, who left for Juventus in July, and the only other active LaLiga players in the division's top 30 all-time leading scorers are Aritz Aduriz and Karim Benzema. 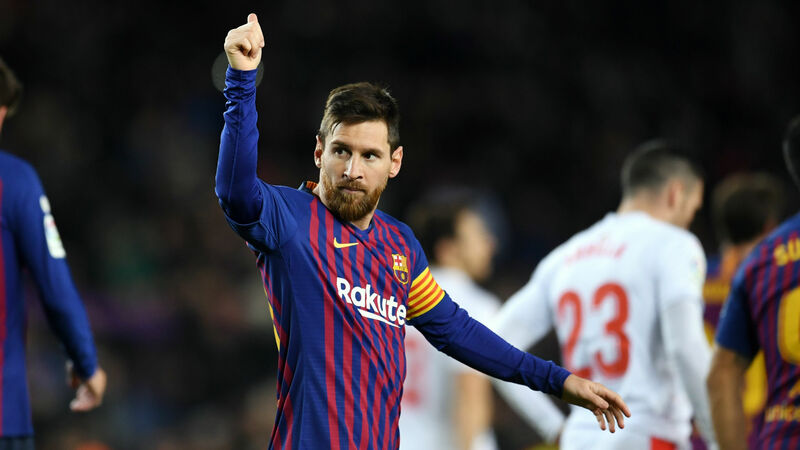 With 17 already, Messi is well on track to score 25 or more in the top flight for the 10th season running, and he was filled with pride to have reached another remarkable milestone. "I'm proud to have reached 400 goals and I hope I can get some more," he told Mundo Deportivo. "I don't focus much on the records or numbers, I prefer to focus on the day-to-day. More than just scoring goals, I think of each game as a challenge where we have to go to win to add three points and fight for LaLiga, the tournament that rewards the most consistent team. "I try to help, but not only with a goal, also with some assists or even participating in some key moves. "It is clear that without the help of all my colleagues, those I have now and those who were before, it would have been impossible to score the 400." Although Messi regards every goal as "special", he did single out his first – way back in May 2005 – when asked about his favourite. "The first against Albacete from the pass of Ronnie [Ronaldinho], I will never forget," he added. "The goals of the Clasicos are always special and against hard opponents that are usually Atletico Madrid, Valencia and Sevilla. Also those that I have had the luck to score in front of our fans. In Camp Nou they are always nice. "In the end, the most important goals are not the most spectacular, but those that serve us as a team to win."